We were excited as soon as we drove on to the property of this lovely cottage on Skeleton Lake, just 20 km from Huntsville. 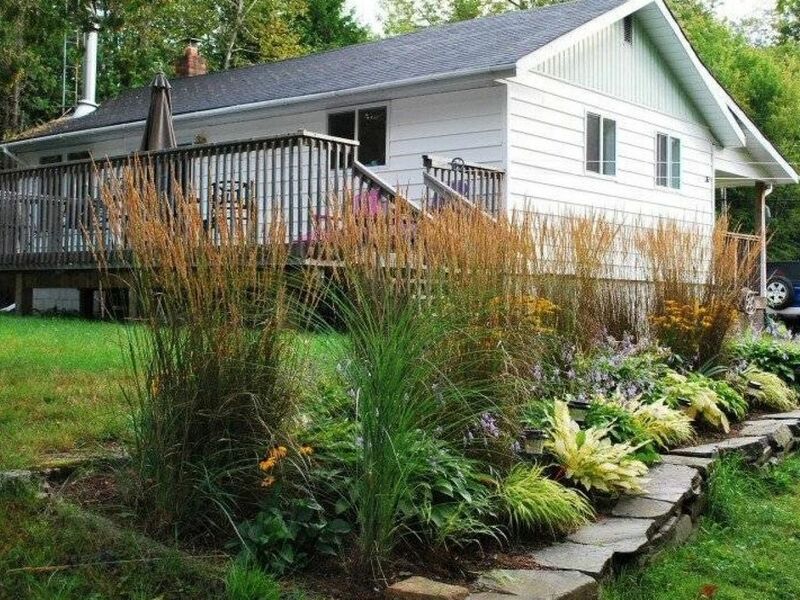 A delightful, neat-as-a-pin cottage with expansive lake vistas and spacious yard, Gallery on the Lake also features a wonderful interior accented with art works selected by the owner. There are three bedrooms - two bedrooms are in the main cottage, a master with a queen bed as well another bedroom with two twin beds. A third bedroom with a double bed is found in the adjacent sleeping cabin, a delightful retreat for those seeking an added level of privacy. The main living area features comfortable seating and a wide-screen television for family movie nights. A dining room table will seat everyone in your group. A separate seating area beside the main living room is the perfect spot to curl up with a book or enjoy a board game with family members. The kitchen is clean as a whistle and is complete with brushed steel appliances that will no doubt please the family chef. The waterfront here is the envy of many a cottage. Trees sway in the breeze, watching over the lake. Entry to the water is hard packed sand which extends hundreds of feet into the lake, making this a fabulous spot for families with toddlers and non-swimmers who want to play in the water. Because the lake is so large, the wave activity can range from glass-like calm to large swells breaking against the shore, bringing a unique set of fun each day. A canoe and kayak are available for a small flotilla to take to the lake and explore. It will be the better part of a day's excursion if you want to explore all the islands however, so pack a lunch! Of the thousands of lakes in Ontario, Skeleton Lake is one of the largest. Unlike most of the area lakes, which are souvenirs of the glacial age, Skeleton is believed to have formed as a result of a meteorite impact. Being a spring-fed lake, it is very, very clear and on calm days one can easily see down to depths of 20 or more metres. According to First Nation legend, the lake acquired its unusual name during a time of scarcity. You'll be happy to know that in modern times, there is no scarcity at all. Nearby Huntsville has everything you will need in terms of groceries, supplies and things to do. Out and about, Arrowhead and Algonquin Parks offer more nature to those who can't get enough. The town of Huntsville is itself a huge art gallery, with Group of Seven murals hung on more than 20 buildings in the area. Golfers will want to spend a day at Diamond in the Ruff, Deerhurst Highlands or Deerhurst Lakeside. Anglers might be interested in spending a day at Lake Vernon with a Hooked Young fishing tour. Check out the programme at the Algonquin Theatre during your stay, although if it's something you want to see, it's best to buy your tickets well in advance. In Winter, snowmobiling and cross country skiing are at your doorstep, and Hidden Valley Ski Club is just 30 km away. Of course, no day at the cottage is complete without a majestic sunset followed by a campfire, some marshmallows and tales of the day - but it's up to you to provide the stories!